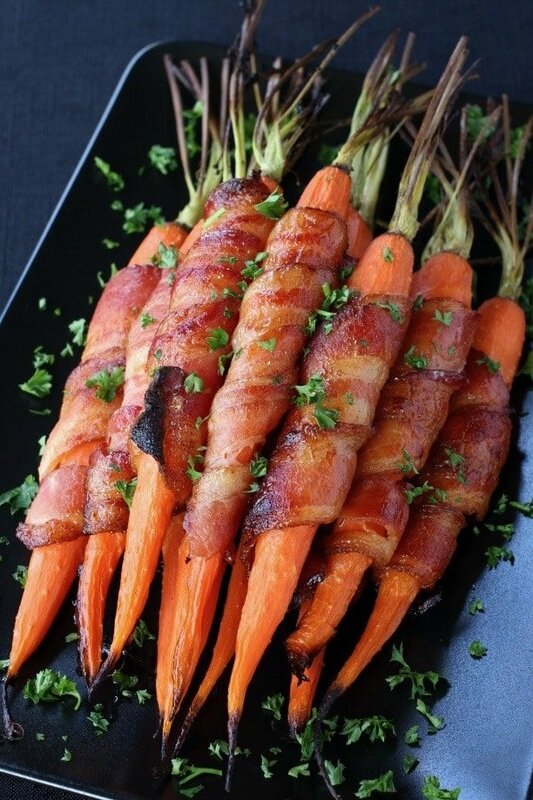 Bacon Wrapped Maple Glazed Carrots are the perfect side dish for any meal! 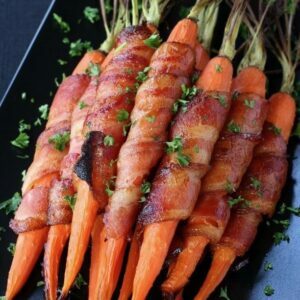 These carrots are wrapped in bacon and basted with a sweet and spicy glaze! These carrots go perfectly with our FAVORITE Grilled Steak recipe, or any holiday dinner you’re cooking, Roasted Turkey and even Spiral Sliced Ham! With Easter right around the corner we’re starting to think about our Holiday dinner. Because that’s what really makes the Holidays, right? Getting together with family and friends and eating. And drinking, of course, but mostly eating. It’s the time when we make the classic recipes in our family cookbooks and the time when you want to break out something different to get the “oohs” and “aahs” from everyone. You can definitely start off with something like this Spicy Mushroom Rice, or even these Fried Whiskey Glazed Brussels Sprouts or you can try these Bacon Wrapped Maple Glazed Carrots. 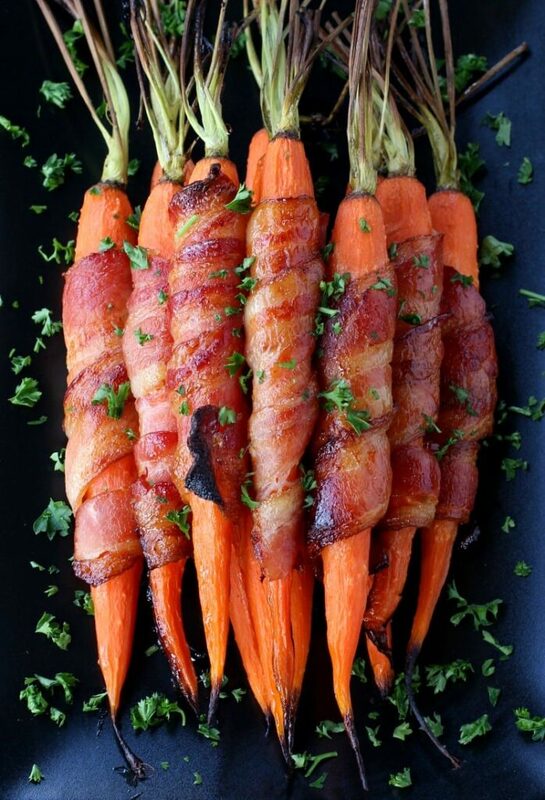 Because anything wrapped in bacon, right? These carrots will make everyone, kids included, grabbing for their vegetables. And just because they’re wrapped in a little piece of bacon – it’s still a vegetable so it’s good for you. I’m going to go with that. If you can find whole carrots with the stems still on it looks great for the presentation of these carrots, but if the stems aren’t there…don’t worry. They’ve got nothing to do with the flavor so don’t run around going crazy trying to find them. The glaze is really easy, just maple syrup (get the real stuff if you can) cayenne pepper and a shot or so of whiskey because you know it’s not the Holidays without a little booze. If you don’t want to add the whiskey, you can totally leave it out. I say add it – but I get it if booze on vegetables isn’t you’re thing. You can even leave the cayenne out and just glaze with straight up maple syrup if you want…the important part here is the bacon. Also roasting the carrots is key because it makes them super sweet so basically it doesn’t make you feel like you’re eating a vegetable at all. Vegetables that don’t actually taste like vegetables. I even have a whole board over on Pinterest dedicated to just that if you want to head over and check it out. 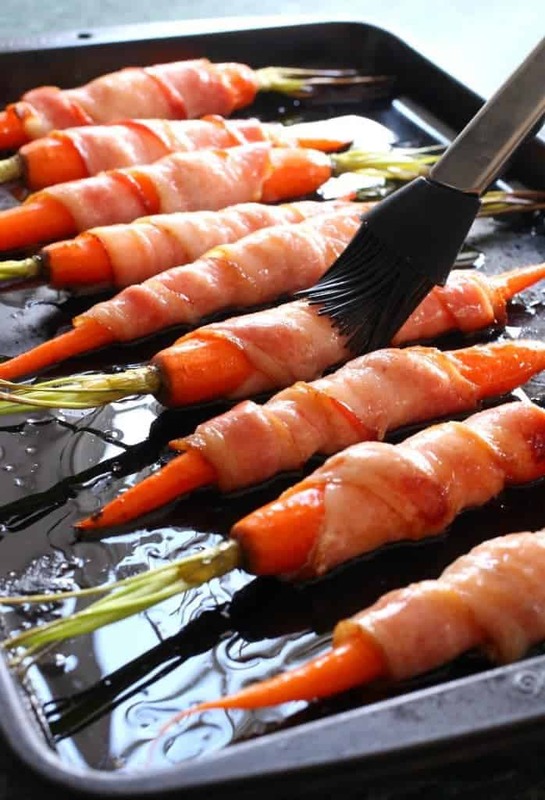 So all there is to getting these carrots ready is to peel them, wrap them in bacon and get them in the oven. About 20 minutes, pull them out and give them a nice coating of the glaze. Back in the oven for another 15 minutes, pull them out and one glaze them one more time. Get them on a platter and serve to all of your amazed family and friends. It’ll be the one time that everyone asks to pass the carrots first! 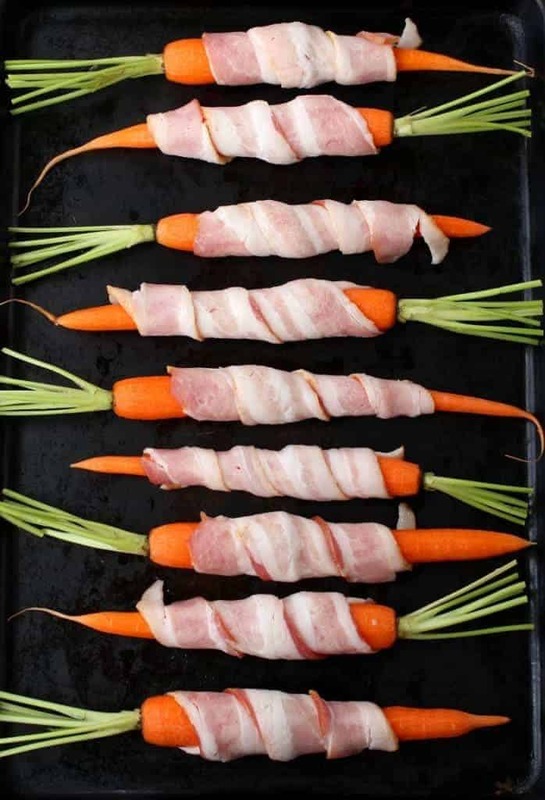 Wrap each carrots with a piece of bacon as tightly as possible so that when it cooks the bacon sticks to the carrots. Place on a baking sheet that’s been sprayed with cooking spray and roast in the oven for 20 minutes. 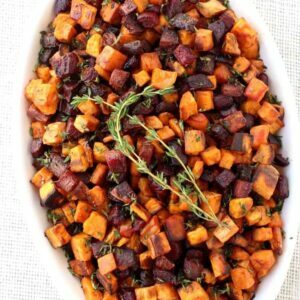 While the carrots are roasting you can make the glaze by adding the syrup, cayenne pepper and whiskey to a small bowl and mixing together. 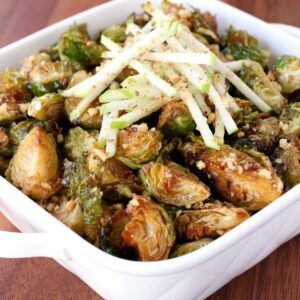 Remove from the oven and glaze generously with the maple glaze and roast again for another 15 minutes. 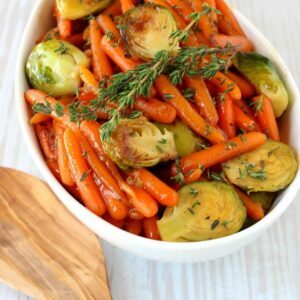 Remove the carrots from the oven and glaze once more, top with chopped parsley and serve.